I live in Whistler, so this garment traveled about two hours from where it was manufactured to my doorstep and testing ground. It was made by Canadian workers just a little ways down the highway, and it feels good to know that gear manufacturing is alive and well here in BC. 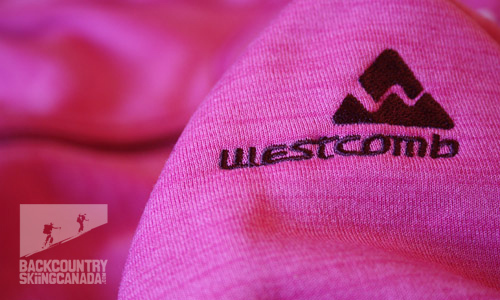 Founded in 2005, Westcomb operates a state of the art facility in the heart of Vancouver, and sources all of their materials from companies with a similar ethical stance on production. The Drift Hoody is beautifully made and clearly a quality product, just as the rest of their award winning line of outdoor gear. The Drift is a technical fleece layer, designed to keep you warm and dry in all seasons. Polar fleece was invented in 1981 by Maldin Mills under the name Polartec. After thousands of years of wearing animal pelts, fur, feathers and natural fibers, this invention changed our ability to stay warm outside forever. 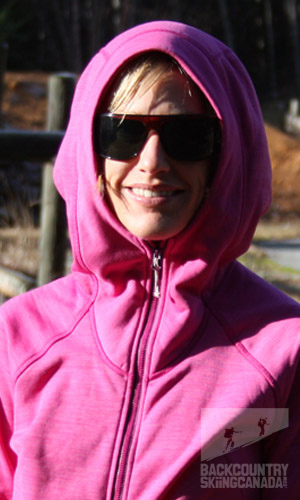 In 1999 Time Magazine declared polar fleece "One of the hundred great things of the 20th century." It is made of polyester threads which are sewn into fabric, brushed and trimmed, creating an incredibly lightweight, warm and hypo allergenic material. Fleece has evolved into a vast array of styles and applications over the years, and the Drift Hoody is no exception. 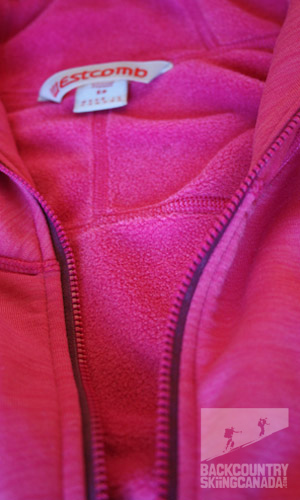 This is not your ordinary fleece layer. The Drift is made of Polartec Powerstretch Pro material, a type of wicking fleece meant to be worn next to your skin. Powerstretch Pro has a soft nylon outer surface for durability and 4 way stretch to allow movement with a close fit. 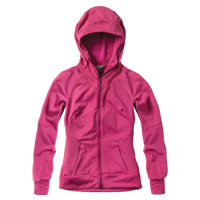 It is breathable, wind resistant and keeps you dry and warm when you sweat. This is by far the warmest fleece I have ever worn, and it weighs almost nothing. Over the past month I've taken it on all of my fall shoulder season adventures - camping, hiking, mountain biking and snowshoeing and it kept me warm every time. In terms of fit, it's very easy to move around in and ultra soft. Oh, and it's *pretty*! I have the hot pink orchid version, and it also comes in lime, cloud, bear and black. My one reservation about the fit is that it is cut for ladies with larger busts. Bust darts are listed as a feature of the jacket on the Westcomb website, however for me this was a major downside. It fits so well all over, until the floppy upper section where it's way too big. This is something to consider if you're a small person and are ordering online. Aside from this, the rest of the design is excellent and it's a great fit through the shoulder area and waist. This is one of the more stylish next to skin layers I have seen, and could easily be worn around town or to the patio for apres bike/hike/ski. It has a big hood, which fits over my bike helmet and my toque with the giant pompom (which I happily discovered on a cold hike) but I would prefer no hood for layering in winter conditions. 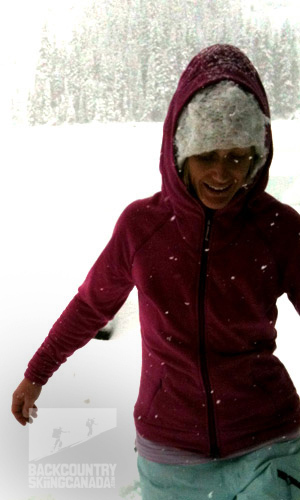 Westcomb's similar hood free model, the Salish Sweater might be an option if you're heading into the snow. The big hood of the Drift filled with snow on my snowshoe trips and snowy bike rides this fall. For the clear days I loved having the hood however. It is cut to match the shape of your face, so when it's zipped up, it can't blow off when the wind comes up. 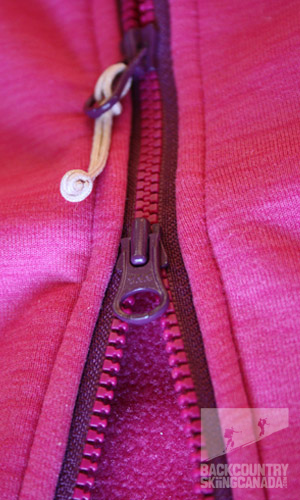 This is a detail that I found particularly wonderful, as I have a collection of hoodys that require either a draw string or a free hand to hold them in place when it's windy. The Drift has flatlock stitching (AKA no seams), and a perfectly soft inside surface, even where the pocket zippers are attached. The cuffs are snug on both the arms and waist, which help hold in warmth and keep out wind and snow. This is a very well built garment all around, and has some fairly technical features which places it on a different level than your ordinary fleece. The price tag reflects this attention to detail at $180. I usually wear a couple of base layers for the shoulder season (a tank top or t-shirt and light long sleeve) then add a lightweight fleece and outer shell if I need them. I wasn't sure at first how this hoody was going to fit into my system, until I realized just how WARM it is. Please take note of the caps used here, as this statement comes from someone who is almost always cold outside. I wore the Drift over just a tank top ascending 1200ft on my snowshoes in a snow storm this week before adding a down jacket for the return trip. It could easily fit into many layering combinations depending on the conditions, but worked best for a cold night in the tent and as a first layer in chilly conditions. A+ for keeping me happy and comfortable. 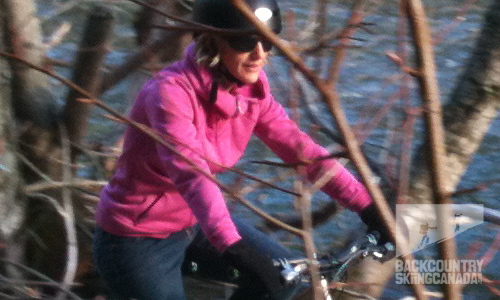 This hoody is extremely warm and light and is versatile enough for a whole range of outdoor adventures, in all seasons. 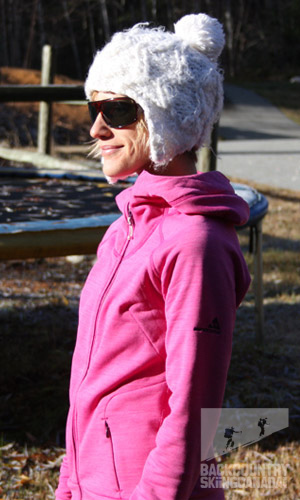 It's great for day or night, and will keep you toasty in your sleeping bag or burning up the trails. The cut was not quite right for my body shape. Pockets big enough to warm up your hands would be nice, instead of the tiny stash pockets on both sides. The price is steep at $180 for a fleece layer. For additional reviews of Westcomb products have a look at our reviews of the mens Westcomb Orb Sweater, Westcomb Cayoosh LT Down Sweater, Westcomb Revenant Jacket, Westcomb Boreal Fleece, Westcomb Tango Hoody and the Westcomb Apoc Jacket with Polartec Neoshell.